This has not been my year. I am sick again, but this time my doctor doesn't know what it is. He does think it is a virus, possibly a flu virus (yes - I got my shot) but I don't have all the symptoms of flu. My only symptoms are headache and nausea - and, oh, the nausea! I've not been able to eat much since last Thursday. Plus, all my inactivity has my back acting up again and my, er, act backing up again. It has been almost a full week now so whatever the virus is it should be close to finished, according to my doctor. I do look forward to a great early March post. But until then know that I am not dead, I only wish I were. I have not posted much lately, but it is the time of winter that not a whole lot is going on. November and December you still have good days (very much so this season!) so are still making things happen. Then the daylight bottoms out and deep winter sets in. Even days that you make plans something is more likely to happen to keep you in during winter. Snowstorms, daylight, temperatures and sickness are all much bigger factors than other times of year. Any one or combination can keep you holed up at home instead of being out dining, shopping or socializing. Even walking around the yard is missed by now. We had plans this afternoon but not feeling well and snowfall has kept us in again. Yes, it is the time of year I start seriously longing for spring. Yesterday I went downstairs ready to dust and vacuum some more, even started briefly, but decided it was going to be more work than results. My cleaning a couple weeks ago is sufficient for now. When I do big basement cleaning again I will approach it better from the start and have it done much more efficiently. 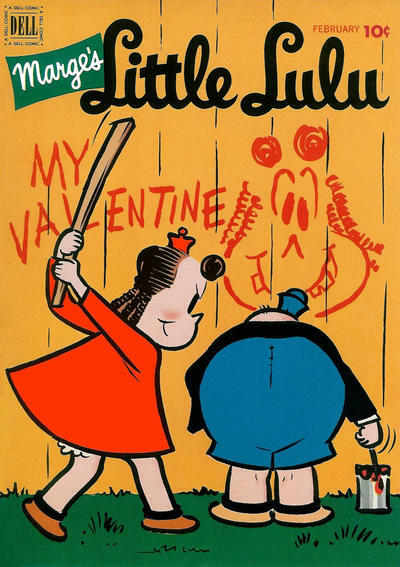 I did read through most of the Little Lulu comics in the magazine I found, not quite finishing because, well, it was boring. Most of the subject matter is pretty simple, and would easily be understood by kids today. But, of course, this is a simpler form of entertainment for young kids and would not be able to compete in this era. After reading I printed off my last post. I used the email version because it was easier and had less clutter. The paper was enough larger than the comic that I folded the two pages in half and placed them in the center of the comic book, just sticking out the top a little bit. Using a mirror, I checked the other areas atop that air return and the only other thing I found was a clothespin (that I left where I found). Then I put Little Lulu went back where I found her. Back to where she lay since - I would guess - the late 1950's or maybe 1960's. We will know it is there - and now you will, too - but we will not disturb it. Maybe someday after we're gone - or moved - someone will find it and ponder it's journey as I did. Or maybe someday someone will be doing work or cleaning and toss it in the bin without looking at it. 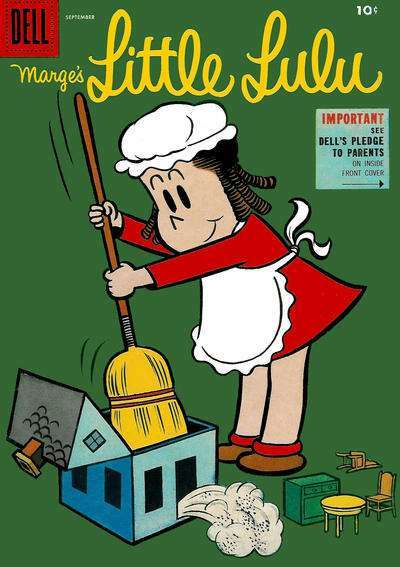 I will only know how it made me think and reflect on the early life of this comic, this house and the family that grew up here. Putting it back may give someone else that opportunity.